All grown-ups know how hard it is to stay on top of everything. It can be so hard to find the time to cater to your kids' individual levels and needs, yet spending special time together in a one-on-one capacity is a necessary and wonderful thing. While we all strive to 'be there' for our kids as parents, (with varying degrees of success), it's managing to find this quality time amidst the chaos and responsibilities of adult-life, that is the undisputed difficult part. 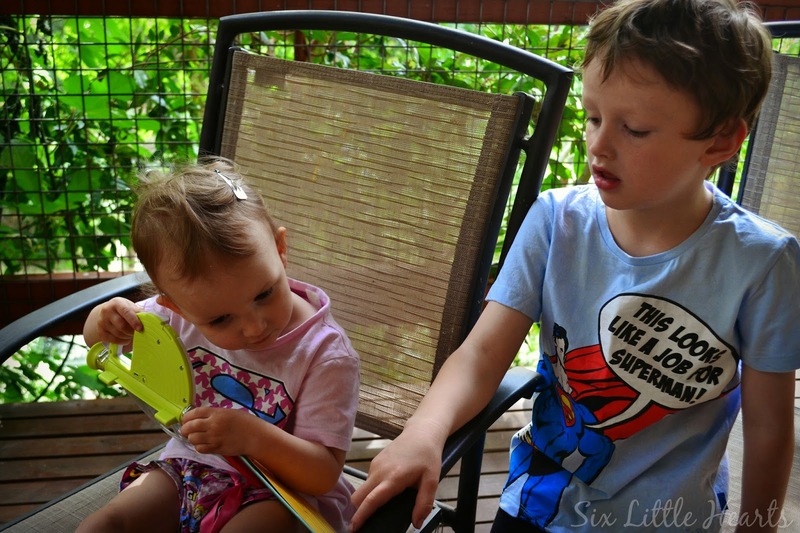 One personal parenting fail of mine that irks me above all others, is that I often get the guilts that I don't spend quality time reading with my kids like I used to - particularly with the younger ones. There seemed to be so much time to lavish on this enjoyable pursuit when I had just a few children, but that time has waned down to nothing as my kids have multiplied and grown over the years. We're always so busy and as you can probably relate, I feel truly, truly terrible about that. I know we are all missing out in so many intricate and crucial ways. My unknowing kids seem to take it all in their stride though, and thank goodness for their wonderful teachers who carry the bulk of the educating load for me - and for us all. Modern technology has again stepped in to fill a gaping need, in a fantastic new product sent our way to road test here. 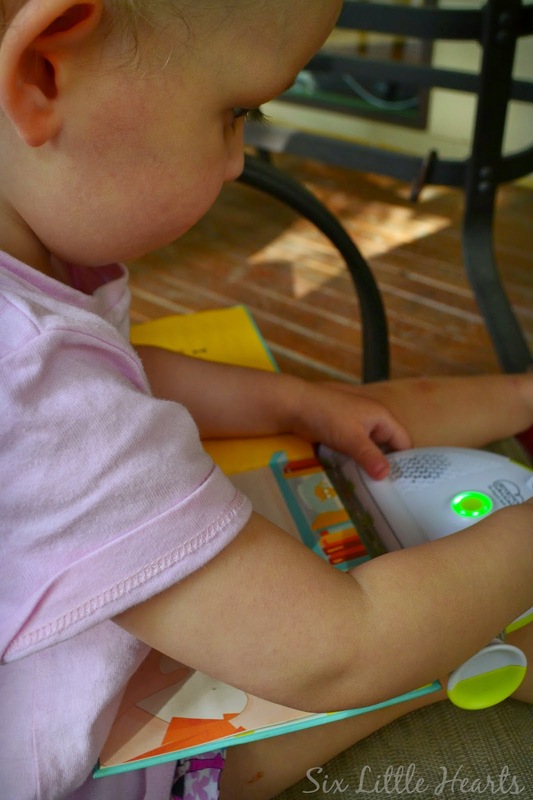 The Sparkup The Magical Book Reader is a pretty wondrous device and it can really help ease some of that parental guilt that we're all nursing. 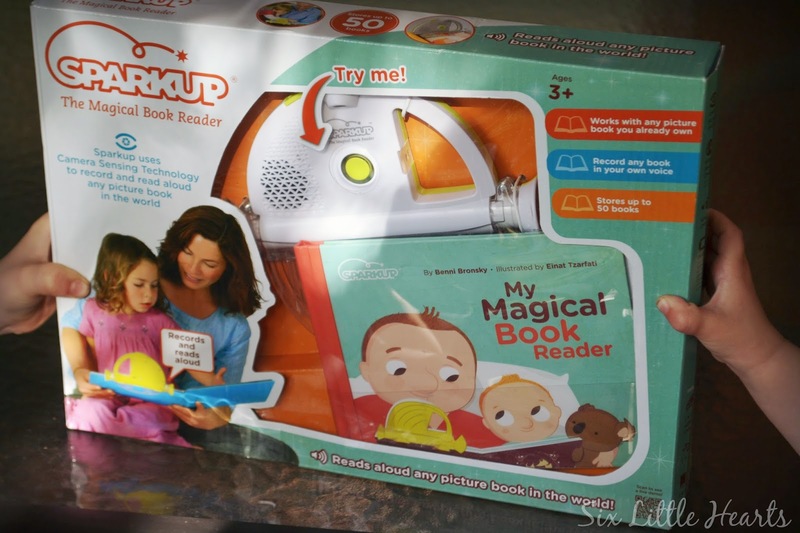 The Sparkup Magical Book Reader is quite an amazing educational gadget in that it enables the excitement of books to come to life, so that the very young can experience the magic of reading - with or without your presence due to time constraints. 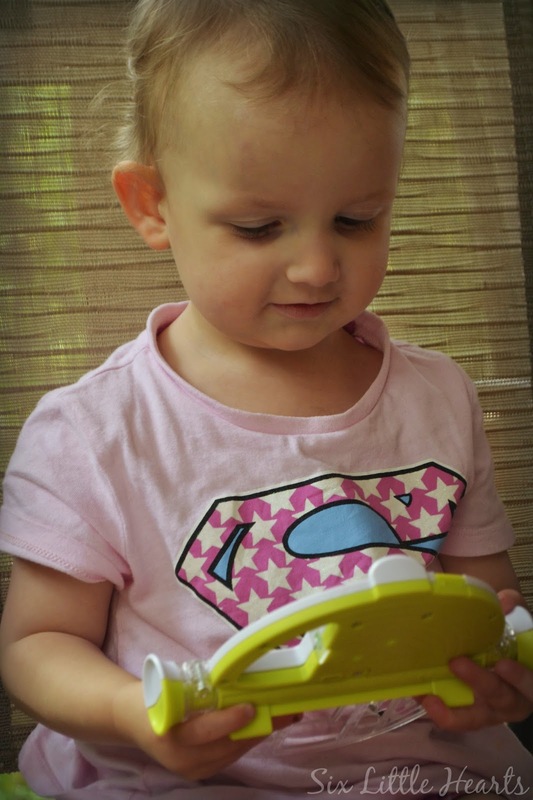 The Sparkup is a device that can independently read stories to your child using your own voice. Let me tell you now - we're all loving this! We've never seen or used anything quite like it and like it we do! "It's mine!" Loving the white-knuckled grasps of those little opposing hands! The Sparkup is both a recording and playback device with built-in camera sensing technology, allowing it to both record your voice and then play it back, using any picture book in the world! 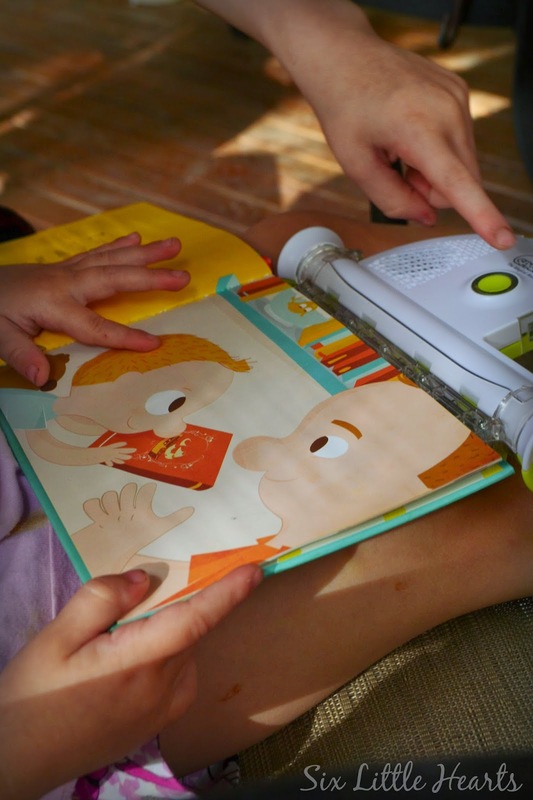 Setting up the Sparkup is really simple: During story time, simply clip the Sparkup onto your child's book. (Absolutely any picture book is suitable.) Press 'record' and read your book aloud to your child as you normally would. Whilst you read, the Sparkup's built in camera technology scans each page and stores your voice and scanned information. Next time your child wishes to read that very same book, they simply attach the Sparkup again, (it sits in an upright position on the back cover), while its technology identifies your pre-recorded book and reads it back in your very own voice! The sound is remarkably clear and the playback volume is in a normal speaking pitch. In addition to your own voice, the Sparkup can record any person's voice, so Grandparents, teachers or a parent who resides elsewhere - even anywhere in the world, can also read a variety of stories to your child and in doing so, expand on your child's enjoyment. The unit comes with its own book to get you started as well as full instructions and a USB too. You can download many pre-recorded books from the Sparkup Reader website as well as store those you have already recorded. The Sparkup is not a babysitter or a replacement for an absent parent, but it is a spectacular way to connect with your child and foster their ongoing relationship with books. For a child with special needs, the Sparkup provides a new way to approach reading and comes highly recommended. 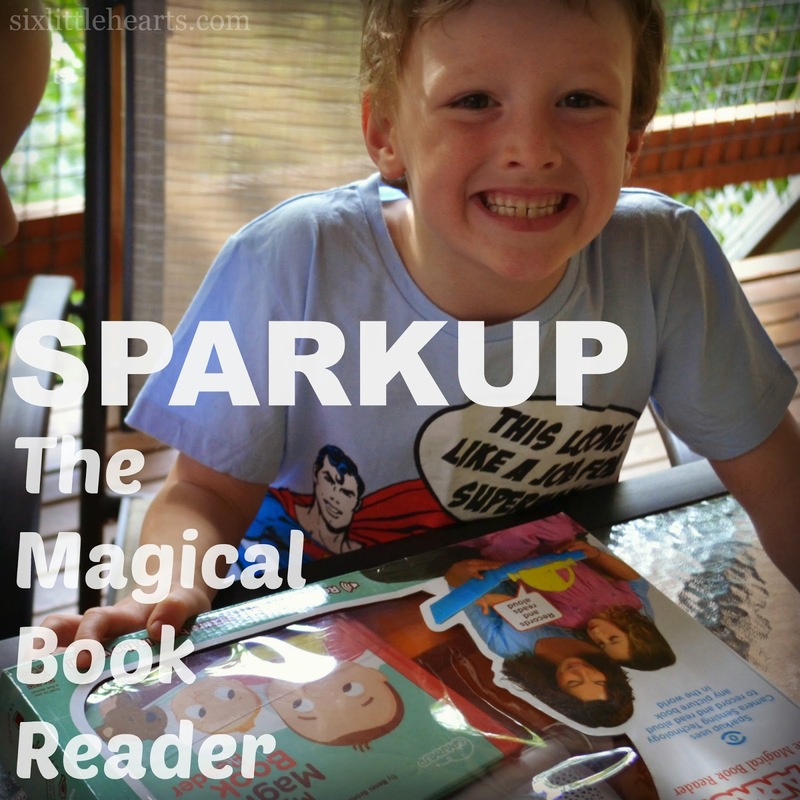 The Sparkup Magical Book Reader has certainly filled a gap in our lives and encouraged my kids to really pester me for some quality reading time together - which is fantastic! I am making the time and effort now, to sit and read with them and as a result, they're then happy to wander off and enjoy their tales at their leisure and for longer; sometimes alone, sometimes together. They've rediscovered their dusty bookshelf with a newfound freedom, pleasure and excitement and I can only say great things about an educational device that can facilitate such things. A really good 10 out of 10 for this product. 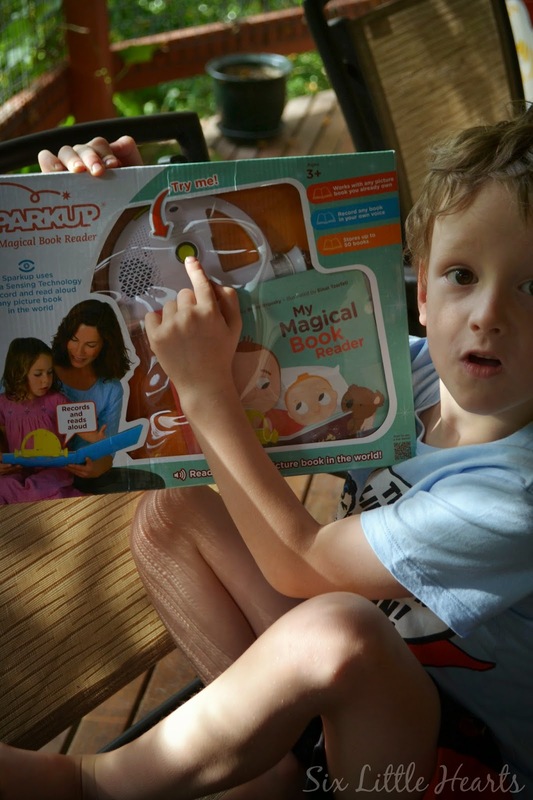 The Sparkup the Magical Book Reader retails for $79.99 and is available to purchase at Big W and selected toy stores and online retailers. 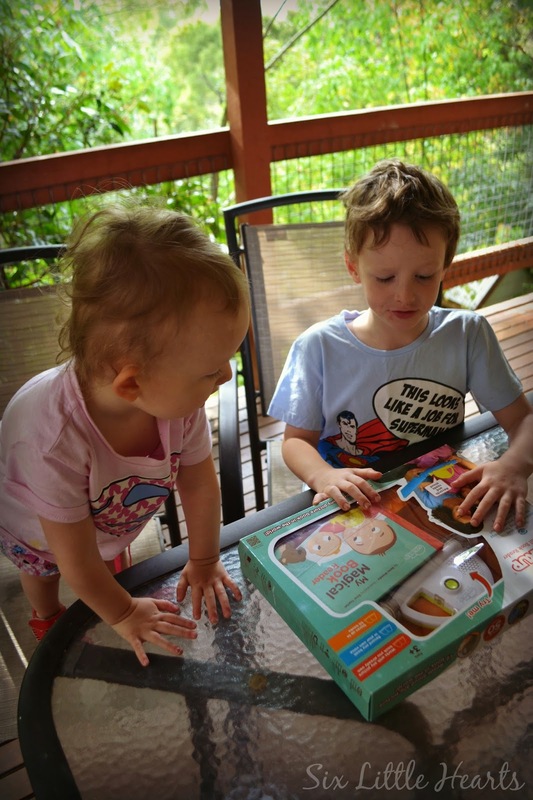 Win one of two Sparkup the Magical Book Reader prize packs valued at $100 each! Open to residents of Australia only. Please share the love and give this review and giveaway a shout-out on your social media using the options below this post. This is greatly appreciated - thank you! Follow the Rafflecopter App below to complete your entries. Be sure to leave a comment as this is a game of skill. Please leave your name along with your comment so that your entries can be matched. Please leave a valid email address that you check often! *Disclosure: Six Little Hearts was gifted a Sparkup Reader for review. Do you find the time to read with your child? 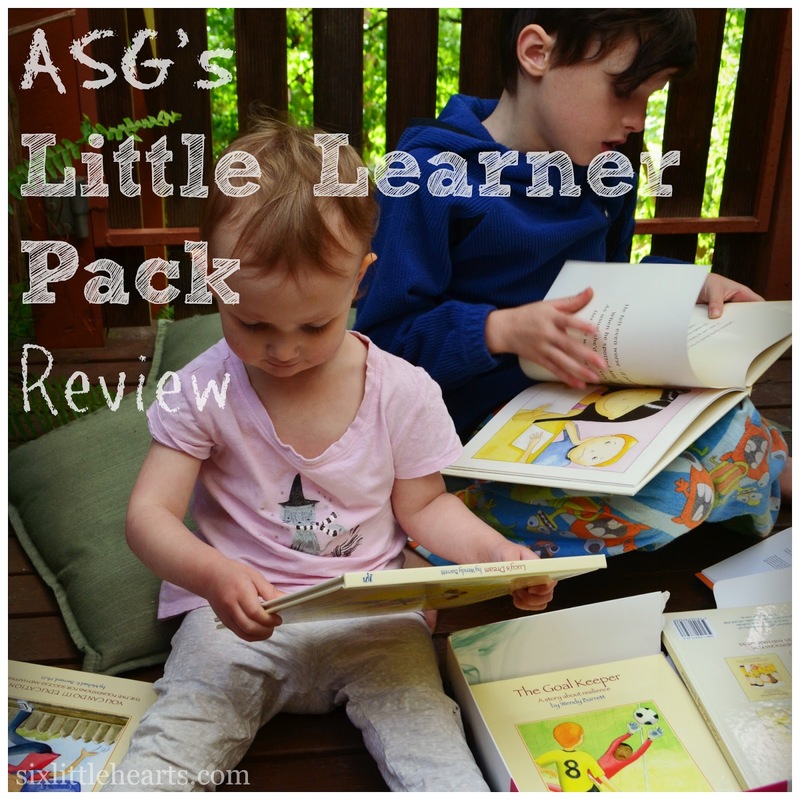 We read a lot, pre-school, and played letter games (and had word puzzles). That all said, it just clicks when it clicks. This looks amazing and we would LOVE to win one. My little girl is obsessed with learning how to read. I point out words that I think she will recognise. I also help her sound out easy words like book or cat. This seems to be helping and she can easily recognise words now. We are always reading to our little girl..even if it's just opening a book and showing her the pictures. She loves books! Begin reading to your children from a very young age. Instilling in them a love of books and reading sets them up for life. And what a special bonding time you create for the two of you. Concentrating on books with lots of colour, tactile touching and animated sounds also makes books so much more interactive and enticing. Both of my girls love books, which is so fabulous. My 5yo is on the verge of reading so I am always praising her for her efforts, even if it is a bit wrong. That positive reinforcement of having given it a go is all she needs to keep on going and trying. This looks great - I know both of my girls would love this. Read the same book multiple times with your child,they will get to know the words and sounds a lot quicker if they see and hear them over and over again. Oh that's an awesome idea! I love it! Would love to win one for my little ones. I remember reading every night to my eldest two but by the time the other three were born I let the regularity go which was reflected in their interest in books (guilty sigh). Reading to kids is so important and I think this is an excellent compromise for busy parents. Why didn't they invent this twenty years ago boo hoo. Read out loud with your kids often, and point to words as you read them so they start to get familiar with often-occurring words. Above all, make reading FUN! Wow what a brilliant idea - especially for those moments when you've just read a story together and they want you to read it over and over again! Reading for us is all about play. And before long, they're a reading gun! When my boy is reading I'm reading too. Because he always tries to copy me. Looks like a whole lot of fun. We do silly voices, lots of expression and really try to make it fun! Patience. 10 minutes every night, its so hard sometimes. I have a 9yr old daughter that just read "Diary of a whimpy kid" in two evenings. I also have a 7yr old boy you cannot read AT ALL. We made a huge mistake with our son, he did not speak until he was four and now has a speech impediment. We spent so much time on speech we forgot the most important thing to read to him. We felt after speech lessons that was enough...so even if they don't seem to be listening and ask you questions about something in a picture (nothing to do with the story) they are still learning. Get them to learn letter recognition and pronunciation first then start with small words and built up from that. With my son it also takes patience!! Making it a fun time, interesting, interactive and exciting. Read to your child as soon as they are born, children are naturals at learning, over time they will start to memorise words, then sentences and that is the beginning of their learning to read journey. Read to you child each day, they will love it and want to participate. Anything that's fun or even a game with encourage kids to learn more and even quicker. Sitting with little one where they can follow the words as i am reading has always worked well for me. Get your children to love reading from a young age. That means reading to them ALL THE TIME. Books are a huge part of our family life. You would be shocked to see how many prep children don't even know HOW to hold a book when they start school. It's truly heartbreaking. Patience! Every child learns differently! Get into a habit every night! Consistency...I read for him everyday throughout the day...I take him to the library story time...I buy new books and borrow books every week...Consistency is the key! My daughter and I have our favourites that we sit down together and read and get great enjoyment from and others where we relax side by side on my bed and read our own choices. A love of reading comes from no pressure and all choice! Phonics and focussing on sight words because working on these builds confidence very quickly, I have found. Fill your house with books and let them work their magic. Never say no when they bring a book to you ....reading is to be encouraged always! Incorporate it into the daily bedtime routine. The easiest way to teach kids to read is to read to them yourself. Reading to my child, and having a lovely collection of books! My youngest daughter has just started Prep and she is thoroughly enjoying it so far. She doesn't know how to read yet, so this prize would be very welcome in our home (plus her birthday is fast approaching on March 16th, so this would be a great birthday gift for her!) To encourage reading, I read every night to her, and we visit the library once a week (sometimes more), and she gets to choose her own books that I read to her. I am a huge bookworm, and my two other daughters also love reading, so I would love if my youngest daughter shared our passion too. Thanks for the chance to win!